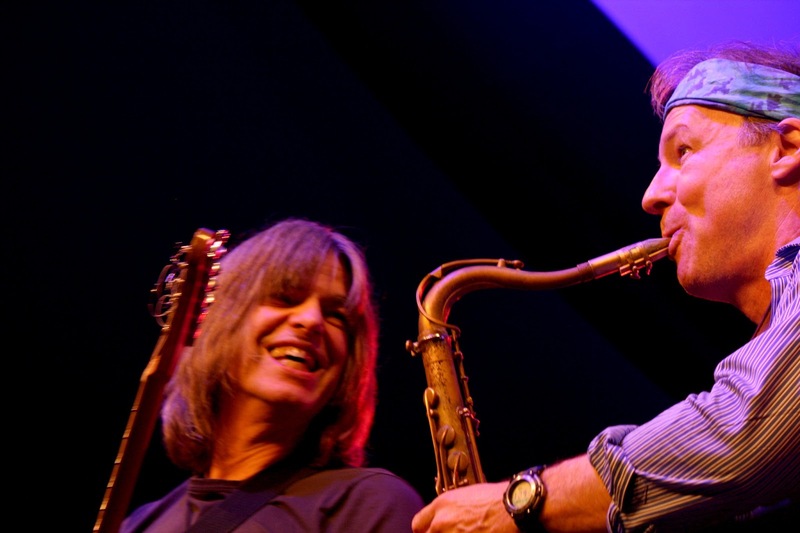 Just something to brighten up a Saturday morning: an extra, particularly happy shot of Mike Stern and Bill Evans from this year's Cheltenham Jazz Festival by Ruth Butler which didn't make it into Chris Parker's Cheltenham round-up. Chris wrote in his review:" A glance at the line-up for the early-evening concert in the Big Top told you everything you needed to know: Mike Stern (guitar), Bill Evans (saxes, occasional keyboards), Tom Kennedy (bass) and Dave Weckl (drums) are the definitive fusion band, the partnership between the frontline pair forged in the Miles Davis post-comeback 1980s band and continued in the present century in New Steps Ahead, the rhythm section old sparring partners with an almost telepathic mutual sensitivity. Stern is simply an unstoppable force, magnificently verbose, apparently possessed of an insatiable appetite for soloing, with his uniquely attractive spangly sound, on his own refreshingly simple themes, both furiously fast and sweetly slow; Evans is a throaty, tireless grandstander (in the best possible sense; this music positively demands such a full-on approach) with a great ear for a catchy tune – and with Weckl and Kennedy tight and tautly bristling under them, this was ninety minutes of pure unadulterated pleasure from four masters of the genre. As Evans commented, pointing at his bandmates: ‘They’re the best at what they do.’ Amen to that."